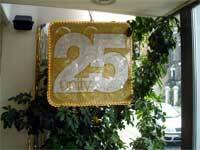 unitytheatre has been presenting and producing performing arts in Hope place for 25 years. During that time thousands of actors, musicians, dancers, comedians, artists, poets, etc have graced the various stages of this former synagogue. I like the live action shots presumably taken during rehearsals. Runs until December 3rd 2005. 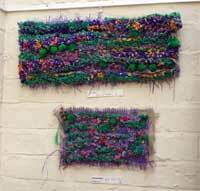 Meanwhile over at Blackburne House there are some lovely inticate artworks made from textiles by Hannah Baer. They are in the Conservatory area. In the cafe there are white abstract sculptures by Chris Pollock. I don’t have any other information except they are due to end on October 1st.